An effort by cities in Santa Clara and Santa Cruz counties to form an alliance to address the irksome issue of airplane noise is finally preparing to lift off the ground. I assume Stanford's wee-hours medical helicopters will be exempt. "negotiating with the FAA" - AGAIN, Congress mandated this assault on human health and the environment, Congress has legalized an industry and its stakeholders going rogue at the expense of people on the ground NATIONWIDE, and so it is Congress that has to right this wrong it started. Aviation stakeholders understand this, which is why they are right now telling our Senators, yes, telling them, that there better not be any amendments regulating aircraft noise to the chamber's FAA reauthorization bill. They don't waste time with the FAA like everyone else, the agency the Congress controls. This fixation on the FAA, Congress members directing people to this agency that isn't answerable to them is another game. And elected officials at every level know this, but they help the game continue. Sadly, I have yet to see people standing up to this in a way that doesn't play right into the hands of the aviation stakeholders. I guess too many are more addicted to flying and shipping by air on demand than they are concerned about human health and the environment. Our Congress is captured, its agency the FAA is captured, local and state politicians are captured, and as far as one can tell, the majority of the people on the ground. Nor the people of Nantes, France, who fought and defeated aviation stakeholders, who trampled their rights along with cronies in govt to the top, and stopped an airport from being built, one that had already been contracted. The people were so many they could not be defeated. They were united and they fought like hell, and they fought wisely. Holy crap, how this issue just goes down the rabbit hole in the US. I'm on 3 hrs of cobbled sleep from this 24/7 BS! For 5 effing years! I am very impressed that local cities are able to join forces on something. Now why can't they join together to get some action on traffic, public transportation, efficient bus service to SFO and SJC, bike rentals, and a plethora of issues that are regional rather than individual city piecemeal solutions? I am getting so sick of the city boundaries forming islands of different or non-action on these topics. The city that needs to start cooperating on this issue is San Francisco. Owning SFO gets San Francisco into the exclusive club served by the FAA, so San Francisco is the only city with any power to demand and get change from the FAA. Peninsula cities need to demand "regional cooperation" from San Francisco on this issue. If San Francisco doesn't want to cooperate, Peninsula cities need to stop cooperating with San Francisco on regional issues important to San Francisco's economy. Those who have grown-up & lived in Palo Alto since the 1950s will remember when Moffett Field housed fighter planes. Those jets would go streaking through the sky leaving vapor trails & when they broke the sound barrier, there was an incredible boom. No one complained. As kids, it seemed kind of cool. Statements from Palo Alto council people Wolbach and Fine suggesting that Palo Alto has been flying "solo" vis a vis FAA after citizens have spent months now years advocating to regional officials during the Select Committee and recently Palo Alto sat for six months on a regional committee with the FAA regarding San Jose traffic. The DC FAA meeting Wolbach and Fine bemoan is an annual junket that council members go to every year with other cities from around the country. PACC members have been going to DC every year - the futility is in those trips. Palo Alto may actually need to fly SOLO by suing the FAA, SFO, and anyone else they can challenge about the mess created by the industry that the City's resolution so thoughtfully looks to consider. It's a pity that council members cannot call things as they are. Or worse if they are misinformed. The resolution appears to be crafted by City staff and it has the diplomatic language that an airport owner uses. "The city that needs to start cooperating on this issue is San Francisco." I agree with you, but it has absolutely no reason to do so because airport-to-airport politics wins, and politics is politics. Let's not forget San Jose, owner of SJC. SJC flights also affect some areas very badly, including some Palo Alto neighborhoods when they fly their "reverse flow" and overfly us at 2,000 feet of altitude and sometimes less. Won't be long, 3 or 4 years, that NASA will be flight testing supersonic transport over us, to quantify the public's reaction and tolerance to modified sonic booms -- characterized as sonic "thumps" in the 70-75 dB range, compared to the old Concorde's 105-dB sonic boom, first flight tested nearly 50 years ago in the days when we were still serious about sending men to the moon. Skunk Works is already two years into the design of the X-59 demonstrator. Today's issues will pale in constrast to coming attractions. "On Nov. 1, 1977, the San Francisco Airports Commission unanimously adopted noise regulations that effectively banned supersonic jets for good." “HIT THE MONEY” is right! My house in midtown now sits as if situated on an interstate highway, with trucks roaring by. Ever stayed in a motel that was just off the interstate? Drowned with noise pollution? Now think, when you have to disclose environmental pollution near your house when you sell, that it no longer is the quiet Palo Alto retreat it was. Buyers might want to think twice before buying. You laugh and think, NOT PALO ALTO REAL ESTATE! IT’S GOLDEN! Well, Years of all talk, no action, by Eshoo, Kniss, and other politicians who pay noise pollution forward, leave me with no hope but to sell before I go out of my mind with screaming jets overhead. And BTW, whenever you feel like choking on our elected officials' hypocrisy about climate change--especially the Democrats who, amid the endless Trump fixation as distraction from the party's own corruption and failures, call themselves progressives (what a standard by which to measure oneself a progressive!) --keep in mind that aviation pollution was not part of the Paris climate accord. Oh, how the pseudo-progressive bang on about, gasp, pulling out of the accord. And yet the exempted aviation industry, the most polluting and inefficient form of transportation, has insatiable capacity increase objectives. Hence the hell of NextGen. Go low, the skies as tarmac, as runways that never have to be built, and build layer upon layer as high as you can go. Sounds like a great recipe for addressing climate change doesn't it? And there's a climate change guy who'll I'll leave unnamed, but if you follow the talkers you figure it out this favorite talker, who flies all around the globe telling people about it and who politicians love to quote. What a joke! These are our "progressives"... But the climate change drum has a nice beat. Much easier than righting the NextGen hell in the now, or the poisoned water in Flint for e.g. Remember the photo ops, pols going in with those "concerned expressions"? I honestly think Trump is the best thing that ever happened to the Democrats. There's been no change you can believe in with them that's for sure but they as well as all the media outlets bang on the Trump drum, something else that's easier than addressing what's really going on for 99% of the population. And so eventually it will swing back to Democrats on a bunch of anti-Trump and empty, abstract promises. This is what our elected officials do because in the end they know who they work for and it's not us. Is there a documented increase in prostate cancer for those under these converged flight paths? Anecdotally, there seems to be. If there were, would it provide cause for a legal challenge? Can we just be blunt about this for a moment? Our city is nicer, wealthier and more connected than many of those around us. We should be able to get this changed EASILY. Why has this not happened yet??? How many important people live here? How much more money does the average resident have compared to other Bay Area towns? I do not understand why we have all this and we still have to listen to planes a few times a day. Simple solution. Replace airplanes with blimps. Since the Paris Accord was mentioned above please read the specifics for that accord in Wikipedia. You will note that each EU country has one vote and the EU organization has one vote - meaning that the main controllers for the accord end up with two votes total. And then look at the countries listed - all of which are having internal disarray in their financial dealings and culture. Also all were at one point a colony of the main EU controllers. So the EU top knows where the resources are and has the ability to go in and manage those resources. And the US gets to be an ATM card for that effort - so we in effect become another colony of the EU. All not to our benefit. Part of climate change is ripping out the forests around the world which were the modifying elements for earth. And who is paying for the continual upheaval in each country? Back to the topic at hand - we already had joint city meetings. It is like we never get off the landing pad here - we are always "going to do something" but nothing happens. We need to get SFO to have a noise quiet time from 10:00 PM to 5:00 AM in which all flights are above a stipulated altitude and are routed over the bay waters vs over the homes going up the peninsula. "Back to the topic at hand - we already had joint city meetings. It is like we never get off the landing pad here - we are always "going to do something" but nothing happens. We need to get SFO to have a noise quiet time from 10:00 PM to 5:00 AM in which all flights are above a stipulated altitude and are routed over the bay waters vs over the homes going up the peninsula." The Weekly fails to mention that. Instead council poeple Wolbach and Fine are quoted saying Palo Alto has been going "solo" because of a stop over at the FAA Public Relations Office in DC? What else is the FAA supposed to tell tourists? We have your back? No, the FAA does not have anyone's back except the people who fly the planes or the air traffic controllers - all 2 of them now (heard they added 1 more controller at night because a recent near miss at SFO may have been because the "1" controller went on break). Hello Weekly! How about you report on how many Air Traffic Controllers are in charge of the jet noise recitals at night? The City appears to be doing the PR stuff that they must teach in political school. Or whatever they are taught in DC when they stop by the FAA offices. Some of our reps do not think there is car traffic problems in town, this may explain why they are beaming under the Nextgen poster at the last DC junket. Scroll down to see council peoples Kniss, Scharff, Wolbach and Fine. Sorry Palo Alto, you cant dump your environmental problems on poorer communities. I look at a comment by Bill H and wonder where that comes from. If the planes at night are at a higher altitude over the water then that benefits everyone. If it benefits everyone then why argue about it. Other cities have quiet times so why not SFO? That is not a expectation that should offend SFO. If you have ever landed there late at night none of the stores are open so it is not affecting the business culture for SFO. And the hotel drivers are not picking up many people late at night so the associated businesses do not have to have employees available 24/7. Running all services 24/7 costs more money than they are making on it. These airport round tables are a very expensive waste of time, energy, and money. It's not fair to the elected reps assigned to sit on these totally ineffective bodies with NO teeth to make anything good happen. SFO is the poster child. What was needed is a lawsuit, preferably by the many cities banding together to share those costs. Then their money would at least be going to something worthwhile. Anything less than an all out combined legal challenge for judiciary relief is like your favorite non super hero trying to fight a super whale with a wooden toothpick. Reminder: the routes were NOT over PA until several years ago when others (county nirth of us) cleverly moved them over this city. Some comments about why flight paths and procedures changed are just inaccurate. Maybe someone lobbied for a change to put planes over Palo Alto from up north, but only the FAA can do that. I've attended enough SFO round table meetings to tell it is an expensive joke. I suggested they add all of the other Cities who are now forming the South Bay round table. One vocal person from our small town said NO - why? Because they will dilute out votes, and their interests are different from ours. Idiotic comments to be sure. Everyone's interests should be essentially the same: maximize real safety, while minimizing actual noise! It makes no difference if the noise is from take offs or landings, what matters is working to minimize it. That is something the FAA is very capable of doing, and has NO interest is doing. BTW - have you all seen the recent article about NASA discovering a method to reduce jet aircraft noise by 70%? My memory of it is that it was not cost prohibitive, but the FAA will not mandate it. They might allow a 10-20 year period of time to retrofit or change over aircraft. That is crazy. It should be done to protect us on the ground. The flying public will pay whatever it takes to fly. All you Palo Altans whining about aircraft noise...how many of you fly on commercial airliners whether for business or vacation? Have you ever thought about how others (in various neighborhoods & regions throughout the country & world) might be annoyed by your particular plane flying directly overhead? Probably not. But boo hoo, we're elite Palo Alto residents and we deserve more consideration & respect than other individuals who endure similar scenarios. As a captain of a 737, I have no control of the noise emanating from my engines when it is airborne & the air traffic controllers strive to maintain flight patterns that will ensure both passenger safety + safe take-offs/landings. If I have to go into a 'holding pattern' while waiting for an approach, so be it. And if my plane happens to be circling over your house for a brief moment, get over it as there are far more pressing issues in life to contend with. As far as hiring attorneys for some kind of class-action suit, good luck with that as allegations don't hold water...only documented facts are accountable. Did someone die or get physically injured from the overhead aircraft noise? Probably not. Palo Altans whining about periodic aircraft noise is like some seaman on an aircraft carrier complaining about the jet noise. It comes with the territory. Tell you what...why don't 99% of you whiners opt for a Grayhound bus (instead of a commercial jetliner) the next time you plan to travel somewhere. "As a captain of a 737, I have no control of the noise emanating from my engines when it is airborne & the air traffic controllers strive to maintain flight patterns that will ensure both passenger safety + safe take-offs/landings." As a pilot you don't have control over anything anymore. You lost your "flying" rights to the color by number type of procedures you have to follow now. Heck you may as well be on training wheels, having to walk over Palo Alto instead of flying higher. It would be nice if you actually didn't even exist and all and we had were self flying machines that didn't cause Pilot errors. That's what Nextgen has been trying to do, eliminate errors, and to be more "efficient" - no luck yet just noise. >>>and all and we had were self flying machines that didn't cause Pilot errors. We can't even perfect that concept on the ground as Tesla has readily proven. And those stupid Google cars with the whirly directional things seem to react slowly. So we're just gonna have to live with potential pilot & driver error for the time being. While you are busy defending the FAA and the aviation industry, the FAA and the aviation industry is busy preparing the national airspace for your robot replacement. Do you really think the FAA simplified the "nextgen" air routes and flight profiles to make your job easier? > While you are busy defending the FAA and the aviation industry, the FAA and the aviation industry is busy preparing the national airspace for your robot replacement. Everyone is replaceable to a certain extent as automation has proven. Judging by the number of amateur pilot crashes, a robot might be helpful in averting air-related accidents. In a commercial jetliner, there will always be a need for a pilot to override the system. Today ATPs are primarily responsible for take-offs & landings. Getting back to amateur pilots... to ensure air safety, the only ones who should be allowed to fly a plane are those with ATP or military ratings. There are too many clowns with single-engine/non instrument ratings who think they can fly. > the only ones who should be allowed to fly a plane are those with ATP or military ratings. There are too many clowns with single-engine/non instrument ratings who think they can fly. I recall my uncle (a retired Army helicopter pilot) saying something along those lines when I was younger. On a recent flight out of Orange County - John Wayne Airport on a Southwest flight to San Jose we were informed before take-off that the plane would make a very fast and high angle take-off to get to altitude due to noise constraints on the residents below. And yes it was a high percentage angle rise. On FB it appears that this is already occurring in Colorado. So that is a total airport dictate applicable to all take-offs. Only newer planes can route here I suspect. The Orange County Airport - John Wayne - is not a large airport and is next to a major military area. The take-off goes out over the ocean before it directs to location. That is an indication that the cities below do have some ability to exercise some leverage over flight patterns and activity. Yes - the FAA is responding to specific areas that are pressing to accommodate the concerns. That should be some leverage for us to apply some pressure to have higher altitude flights over residential areas and to start the approach lower down the bay so that the incoming is over the bay vs residents. That should be a reasonable change to expect. The pilot who lives in Portola Valley has provided no helpful information regarding who is controlling the plane on the approach - is it on automatic pilot up until it reaches the airport - at which point the pilot engages in the actual flying of the plane? Where does that transition take place? >>>>The pilot who lives in Portola Valley has provided no helpful information regarding who is controlling the plane on the approach - is it on automatic pilot up until it reaches the airport - at which point the pilot engages in the actual flying of the plane? Where does that transition take place? If you were in one of those 737s, they have the fastest & steepest climb rates of any commercial jetliner. You will know if you are flying in one. Can't answer your second query as the key role of the ATP during landings is to decrease speed upon approach/flaps down & reverse engines upon landing. "the only ones who should be allowed to fly a plane are those with ATP or military ratings. There are too many clowns with single-engine/non instrument ratings who think they can fly." Agreed. Flying out of Reed-Hillview (San Jose) is one of the worst areas. A pilot has to constantly be keeping an eye out for other planes flying directly overhead. The tower only instructs landings & take-offs. Flying space is open & unrestricted. easier. It is what our whole economy and country is based on. it's a good thing. up for a little trichloroethane nostalgia? I need some help on this matter. Planes coming in from Hawaii and the Asian Countries - China, Korea are crossing the Pacific on automatic pilot. The plane is flying at the direction of some mega planner that is coordinated at some location which controls an area - vs the airport destination. At some point when the plane crosses over the highest location in the coastal range and starts it's decent into the bay area is it still in automatic pilot - and at what point does the pilot actually engage the control tower at the destination point. We already know from previous stories in the papers on the problems at SFO that they do not have enough traffic controllers. So what are they responsible for? Directing traffic on the ground to get the plane to the right gate for deployment of the passengers? However this whole operation used to work and how it works now under NexGen is confusing who is responsible for what aspect of the total trip. I am concerned that the 3AM Korean plane is flying at the judgement of the pilots who have been in the air for a very long time and have probably been sleeping. Or is some mega plan directing the plane to a very low altitude just to irritate the residents below? If total irritation is the goal of who ever then congratulations to all. It has happened. So to be effective here we need to figure out where the control points are and who is making those decisions. And it is not the SFO roundtable because they are already next to the bay where the planes have already lined up - over the water. Possible the Portola Pilot can tell us the specifics here - or has he signed some agreement as part of his employment to not discuss the specifics? Planes do not randomly run over the ocean, houses, and bay so who is in charge of the various check points within the flight cycle? You're talking early 1950s. Jet fighter planes were relatively new then. I was referring to growing up in Palo Alto during the late 1950s to early 1960s. The Cold War was probably a factor but it was common to see & hear jet fighters out of Moffett Field flying through the skies over the peninsula. "The Cold War was probably a factor but it was common to see & hear jet fighters out of Moffett Field flying through the skies over the peninsula. If you do some research, the damage that loud noises make is particularly damaging to children and more so for autistic children and if you look into the problems that night time jet noise causes it's another host of problems. Even if you are not awoken by jet noise, jet noise causes health damage. Some things are "fascinating" but are not necessarily good for you in regular doses. An occasional sonic boom never hurt anyone. Wondering how many of these anti-jet people ever went to see & enjoyed watching the US Navy Blue Angels or USAF Thunderbirds. Next week, effective 2:01am August 16th, the shape and altitudes of SFO Class B airspace are officially reconfigured. May be some news coverage, maybe not. Local general aviation pilots are studying the new charts. okay - so let's bug the newspapers to print what they are doing to the air space. Airliners flying into SFO have a flight plan and are communicating with air traffic control continuously from engine start until they reach their destination gate. Look at today’s Asiana 212 from Seoul to SFO. They filed a flight plan to fly a Pacific track followed by the Bodega 2 “arrival” into SFO. Over the Pacific, AAR212 talks to an oceanic controller. About 100 miles offshore a controller from Oakland Center clears them into US airspace. Oakland Center controls airspace above 18,000 feet over Northern California, Southern Oregon and part of the eastern Pacific. Oakland Center cleared the flight down to 18,000 feet and handed it off to Norcal Approach. Norcal cleared AAR212 to descend and assigned them a heading to connect them with an “approach” into SFO for a specific runway. SFO tower assigns the approach, but Oakland Center coordinates with SFO tower to get the plane to the right fix to start the approach. About ten miles from the airport, Oakland Center hands the flight off to SFO Tower. SFO tower clears the plane to land and hands the flight off to SFO ground after the plane lands and exits the runway. The autopilot was probably on until the plane was a mile from the airport, but it's just following commands from the flight crew who are following their ATC clearances. There’s no point in the flight when the crew is improvising: they’re always flying their assigned or filed route. They’re always communicating with air traffic control whose number one job is to keep airplanes separated. Long flights have multiple crews to ensure there’s a rested pilot. It’s a highly regulated system designed for safety. As far as routing planes farther south down the bay for arrivals, you have to manage potential conflicts with departing San Jose traffic. There’s no simple answer as long as we have three major airports (SFO, OAK and SJC) in a small area. "Next week, effective 2:01am August 16th, the shape and altitudes of SFO Class B airspace are officially reconfigured. May be some news coverage, maybe not. Local general aviation pilots are studying the new charts"
I warned Santa Cruz aircraft noise activists two years ago that the FAA would solve the problem of "nextgen" descent profiles violating class B airspace over Santa Cruz by simply adjusting class B airspace to accommodate the lower "nextgen" descent profiles. Thank you for the info. Is the problem the filed route in which they are way to low over residences at 3 AM? Who arbitrates the altitude of a filed route? We all have complained about the flight for a number of years and half the time it is marginally acceptable and the other half it is horrible. It varies. So Korean Airlines is filing a route and that is it? As long as they follow the filed route they are good to go? What if the filed route is unacceptable? The filed route is unacceptable for a low altitude at 3AM. And half the time they are making it up. Who is the group that says the filed route is too low in altitude and they have to correct the filed route? There is a giant gap in the procedure in which we have planes that are too low in altitude in the period 11PM to 5AM when it is most noticeable. We can assume there is less traffic in that time period so adjusting the altitude should not be a major safety issue. Calling SFO does no good here - we need to get to the flight approval people. Altitudes are assigned by air traffic control following rules set by the FAA for safety of flight. SFO is not assigning routes or altitudes. They are assigned by air traffic control which is part of the FAA. Sorry if it's a bit confusing. The bottom line is that the city council is tilting at windmills. It's an easy political point to say, "I went to Washington and they didn't listen to me," but that's childish talk. A smart move would be for a regional group to negotiate over late night routing, but someone has to agree to take the traffic and the FAA won't design routing where flights from SFO and SJC conflict or where flight safety is compromised. They won't establish a steeper approach into SFO because it doesn't follow their design rules. They won't abandon NextGen. Conflicts with SJC at night? Why? if there is curfew there. Confusing indeed. If Air Traffic Control assigns altitudes "set by the FAA" for safety of flight, what is it about Nextgen that makes them so low and loud even in the absence of much traffic in the air? What's the switch that makes pilots incapable of landing a plane at night without having to scrape the rooftops of several cities? Just move along. Nothing to see here folks. The FAA just adopted new "Stage 5" noise standards for aircraft certification and it might even phase out obsolete "Stage 3" aircraft in your lifetime. Working with other regions to encourage Congress to mandate a phase out Stage 3 aircraft is a good way to waste your time encouraging the FAA to do something they are already going to do, since the airlines are ready to start sending "stage 3" aircraft to the bone yard. Thank you to whomever explained SFO arrival routes, filed flight plans, and air traffic control. A google search for SFO runway 29L approach plates would be Too Much Information. Only relevant to readers here who follow any fuss that erupts next week. Sorry, SFO runway 28L rather than 29L. Magnetic pole has not shifted that much yet. In the days when old timers remember jets at Moffett Field, how many people lived in the S.F. Bay Area? Less than 1/2 of the 7.5M we have now. There was far less jet activity, and far fewer ears to bother. Yes, some were screamers, and as a kid we would find those very cool - I still do, but it is cargo and passenger jets that are not passing over our homes way too low, and way too often. And back to Capt. J. Hillman - how is lower and closer together safer? Resident of Adobe Meadow: John Wayne Airport has a specific exemption from the Federal Aviation Acts that were passed after they imposed their flight regulations. New curfews are not allowed. When people learn of a few airports that have special rules, then say if they could do it, we should be able to do that here, those people are uninformed, or misinformed. Those who have taken the time to do the research understand how screwed we are based on Congressional actions, and FAA being left to interpret what Acts of Congress mean for the aviation industry. Congress has passed many Aviation Acts, but NONE of them includes ANY of the language needed to protect the public. Until the FAA is forced to restate it's Mission Statement as being to PROTECT PUBLIC HEALTH AND SAFETY, we will get no relief. The FAA's current Mission Statement is a FRAUD = Safety and Efficiency. Well they've made it less safe, and efficiency means connecting the dots, so instead of honoring long standing routes that were designed to minimize flying over densely populated areas where it could be avoided, the FAA has used NextGen to create jet highways over our homes. By limiting flight dispersal, they can claim to have reduced the noise for the majority, while really pounding the Hell out of the minority. The only winner in this is the airlines saving fuel. The SJC curfew bans older, Stage 2 aircraft after 11:00 pm, but there's a long list of authorized Stage 3 aircraft including versions of A320 and 737. Some newer aircraft including the A350 and 787 are Stage 4 and also have no curfew. Authorized types can operate 24 hours per day out of SJC. 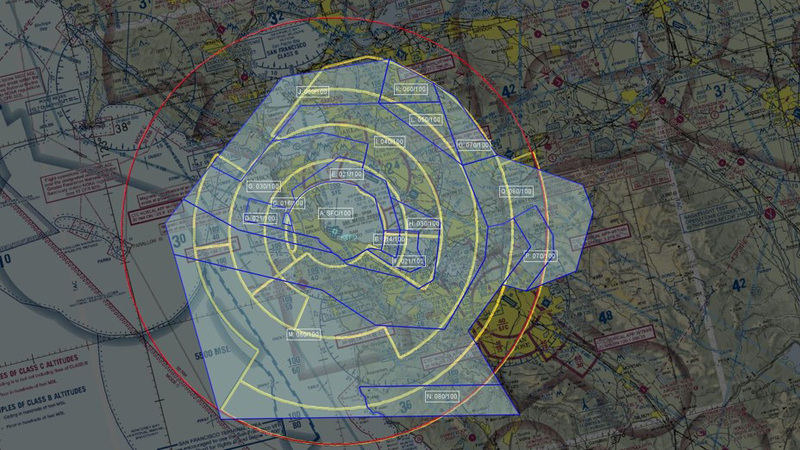 Bay Area airspace is a very complicated topic and it's unfortunate that the real experts can't give a simple explanation about why it works the way it does. City Council members pretending they can do something about SFO in your lifetime is just a political ploy to distract you from local problems they won't fix. I suppose we now have to wonder and prepare ourselves for an airline employee stealing a plane and crashing it in our Baylands! Living near an airport has now another hazard to prepare for. So for SJC we are back to who is the authorizing authority? Someone is making a determination as to type of aircraft. Is that the same group who is allowing the "filed route" to prevail despite the fact that the "filed route" is unacceptable? AS far as I am concerned the issue is the filed route and the limitations that the participating airport has stipulated as the minimum altitude which is not up to the airlines choice. If we start with a minimum altitude level that is beamed into the aircraft's automatic pilot and flight plan than we can eliminate half of the problems which should not be that hard to do. So bay area - put some rules in place that are a minimum requirement to be met in order to file a flight plan. Right now we have the tail wagging the dog instead of the dog wagging the tail. In many civilized places pilots are fined for making noise, their local authorities have worked out rules to respect noise sensitive areas, most have real curfews, not negotiated grandfather whatevers with weasel excuses. Counties can fine pilots if they would chose to but the well organized flying experts would never allow that. Your lobby has done the greatest disservice to people by making people believe that it’s ok to not have any protections of the public. Feel free to lobby Council about idling cars or banning sodas. I understand you guys are testy, but airspace is regulated by the FAA, not by SFO, SJC, Santa Clara County, Sacramento or Anna Eshoo's office. The current regulations are designed for safety of flight and operational efficiency and issued after multi-year expert analysis and public comment periods (The SFO Class B redesign has been a multi-year process with a couple rounds of public comment). Many of the rules are coordinated with international organizations. Airlines file flight routes, and ATC clears the routes and assigns altitudes. There's no improvisation going on with inattentive crews or routes getting "beamed" into autopilots. I wish the real experts on the air traffic system could explain how it works and what some of the limitations are. Things like how long it takes to equip the airline fleet to take advantage of new technology like GPS satellites. It's fine to bang on your city council to do something. It's nothing but political grandstanding for them to pretend they can do anything. Great politics is not always good policy. Many civilized places have better policies, protections, and curfews because they don’t have the greedy lobby that has captured the FAA for years and years. And those airports are just as safe. Your biggest threat has apparently always been noise and it doesn’t allow you to think about anything except to feed the same “it’s the FAA” line when the FAA is really you. All about your needs, your costs and Congress jumps as high as you want them to. The estimated fuel savings for the entire Northern California Metroplex with Nextgen is $6 million. Everything the FAA does is built like a pyramid of lies with each small lie resting on a larger base of lies, and the whole pyramid of lies is designed to obscure the FAA's complete subservience to the aviation industry. Pretending to work with angry taxpayers but instead leading them into political and bureaucratic quicksand is just another one of the many service the FAA provides to the aviation industry. The foundation of lies comes from the greedy lobby that has captured FAA. That’s why all the dues paying flying experts gravitate to these threads to gloat or to be cynical, defending this standard of duping the public. What are you all so worried about? Let the public have a table with FAA and why not show your faces at the meetings? You probably don't mean to, but you sound a lot like the coal-rolling "EPA just builds on lies to serve their radical enviro base" people. Work the process. Get Congress to update the goals and mandates for the FAA. Switch your air travel to SJC and OAK and lobby the airlines to operate fewer flights from SFO. I'm not part of the aviation lobby. I'm someone who thinks our city council is using airplane noise to score political points and distract voters from issues like local traffic (which they claim doesn't exist). No need to worry about any political points being scored anytime soon with airplane noise and car traffic is no less a regional issue. You sound like the SFO Roundtable people who rejected cities outside San Mateo for fear of their not getting enough attention. Provincial thinking is part of the problem for many issues but not that it matters to those who worry and fear about something else getting attention. Why don’t you get a regional car traffic roundtable? All we need is 1 rep, not all 7 or 9 council to work on it. I love your idea of a regional car traffic roundtable. MTA is supposed to do this, but they have not been very effective. Locally we've had a Don Quixote council tilting at the FAA for political points while they refuse to discuss business funding for Caltrain grade crossings. Mayor Kniss denies there's traffic while Scharff and Wolbach try to fast-track Caltrain grade crossing plans after wasting years in securing proper funding. SFO noise is a distraction in every sense of the word. SFO is run by SF. It would be great if all three international airports were transferred to a regional authority with a noise abatement mission. That will happen just after all the Bay Area governments merge. "Locally we've had a Don Quixote council tilting at the FAA for political points while they refuse to discuss business funding for Caltrain grade crossings. Mayor Kniss denies there's traffic while Scharff and Wolbach try to fast-track Caltrain grade crossing plans after wasting years in securing proper funding. SFO noise is a distraction in every sense of the word." Palo Alto infrastructure issues have been around forever and you are worried that having a seat on a regional table about airplane noise is a distraction? So what's the idea, drop everything to only look at what you are only now choosing to worry about? Based on info above the ATC assigns routes and altitudes. So where is the ATC for the bay area? ATC is an acronym - what does it stand for? Is that is where the fix is for mandating a minimum altitude level over residential areas? Once the planes are over the bay then that is a different story - usually at the San Mateo Bridge is the cross point. We are concerned about the altitude from the point the plane crosses over the coast range and starts the descent to the point that it crosses the San Mateo Bridge. Of course that is for planes coming in over the Pacific. We have a different problem for the planes coming up - or down the coast. But solve one problem at a time. Where is the ATC and who is in charge of it? Name, rank and serial number. If this is in a computer program that is fed into the plane on automatic pilot then it can be changed. But back to the Korean flight at 3AM - they are all over the place - sometimes okay and other not okay. NO reason for that is acceptable. Nothing like the FAA website for an abundance of information if you understand the lingo used. But they do have a FB page. They may live to regret that. So what we have now is a new head of the organization effective 01/06/18 - Daniel Elwell - acting. And we know that the Western Pacific Regional center is in Lawndale, CA (Long Beach). I once needed to go to the Long Beach Airport but that was near impossible from San Jose - I would have needed to go to Phoenix first. That airport has very limited access. And is in the middle of major corporate office buildings and complexes - engineering related. It looks like the local ATC is Oakland - code ZOA. There is a volume of listings for each location reporting references to altitude so this topic is at the top of their priorities. Given that go in for the approach concerning altitude, noise, and aircraft limitations by type at specific times of the 24 hour cycle. We can do this. Get the gang going here and make it happen. Oakland is the reference point - there is a lot of reports on altitude. The city needs to pass an ordinance banning political signs about airplane noise. We are trying to sell our home and the realator says people try to make lowball offers when they see the quite skies signs in our neighbors lawns. Maybe after banning Quiet Skies, they can close the Palo Alto airport? Isn't it funny how some people hide behind anonymous comments, and others seem to have an excess of mean to share with people who have done nothing to them except express their right to freedom of speech? I love this guy Dan who couldn't care less about the jet noise issue, but thinks he's going to feel it in his pocket when he sells his house. SELFISH Dan! If you think the noise is no big deal, maybe the house buyers will agree with you and bid up the price of your home. Happy moving days! There is no need for planes landing in SFO to fly over Santa Clara County or Santa Cruz County at low altitudes. It's convenient for SFO, because they can rake in the dollars and avoid complaints from San Mateo County and San Francisco neighbors, who (unlike Palo Alto and Santa Clara County residents) actually have a seat at the table and CAN shutdown or restrict SFO by law. The solution is simple. Impose a $10,000 per instance fee for all planes that enter Santa Clara County airspace at an altitude below 10,000 feet and don't land in Santa Clara County (so this would rightly exempt SJC and Moffett). Santa Clara County airspace belongs to Santa Clara County, not to San Francisco. Another alternative is to route all planes landing in SJC right over San Francisco. It won't take long for them to get the message. I'm not in favor of this solution, two wrongs don't make a right, but it's there as the last resort. "The United States Government has exclusive sovereignty of airspace of the United States." Sorry JR McDugan, but your proposal is illegal under federal law. Are you 100% sure that counties can't impose fines? The city of SFO has major buildings which prevent continual air traffic - my opinion. I am now concerned that San Jose has major buildings and Redwood City is getting major buildings. Yet we in PA somehow limit our building height. We have set ourselves up to be the lowest continual point which creates our problem? Just wondering here - SJC runs next to large buildings but has a clear flight path. Have we purposely locked ourselves into this problem by the limitations we have imposed on our building height? If we had tall buildings then the Korean plane would have to reconsider when the pilots wake up to take control of their plane. And yes I really mean that - they cannot have such a variation on how they function without some variable activity going on. ATC should be looking into what is going on there. They need to wake these people up over the ocean before they even get over our heads. Facts on building heights - the SF Salesforce building and the other new buildings going up in SF are definite buzz kills for any commercial airline. RWC has numerous building going up right now that are now available for occupancy which are in excess of the 4 story limit we have imposed on ourselves. We have created the flight path for commercial planes and private planes using the Middlefield route to San Carlos. I am up in RWC about once a week and the smaller, noxious plane by passes the large hospital on Veterans and is crossing over the bayside at that point. That smaller plane is not over the larger buildings that are at the end of Seaport Way. We are allowing the Palo Alto Airport and San Carlos Airport and it's supporters to corral air traffic in specified routes. The city is a participant in this whole problem. And there is a reason that the Sunnyvale golf course is cross the freeway from Moffat. There is a reason the Palo Alto golf course is next to the Palo Alto Airport. The ATC's are handing off the planes functioning from automatic pilot to the plane crew and you have a whole bunch of young pilots who still have their training wheels on. The SF incoming over water is daunting to new pilots. We happen to be at a crucial point for transition of control points and the people who have those jobs are in various stages of training. So the problem at hand is establishing who is in control of the plane and working to specify the minimum altitude allowed during this transition point. Pinpoint who is in control of the plane at what points in the descent and specify altitude limitations at each point in that transition. If that can be accomplished as a minimum first stage in the correction of the problem then we can eliminate a large percentage of the aggravation. And if I understand the comments above SFO is not directly involved in that function - the ATC in Oakland is. And that ATC reports to the location in SOCAL in Lakewood - aka the Long Beach Airport. That airport is surrounded by large government contractors so lock in who is responsible for what. "The location of air routes has nothing to do with building heights and everything to do with politics. The height of even a ten story building (120-150') is small compared to even the very lowest commercial flights we see over Palo Alto (about 2,500')"
This is consistent with the fact that there are many areas without any tall buildings in San Francisco and along the Peninsula, that is basically irrelevant compared to the other reasons. Two big cities to the North and South, with powerful Mayors over the years - who do you think calls the shots in Sacramento and Oakland Center? If you really want to know why you lose sleep at night and people in San Francisco and San Jose sleep ok - look past building heights. Remember that San Francisco, San Jose, and Oakland all benefit financially from your loss of sleep. Everyone who is suggesting to direct attention to FAA needs to re-focus and look closer to the airports and the political leadership of the region. Before opening up your checkbooks to the figures that run the aviation show for the Bay Area, think about what they are delivering. I am not consumed by building heights - I am consumed by the mis-directions to who we need to be pointing our complaints to and why that is. All SFO is doing is getting the plane on the ground to the right gate. How the plane got there is the problem of the ATC handing off the landing to the pilot. And the ATC is presumably the group that has approved the flight plan. If the flight plan is loaded into a computer then there should be error points that the altitude is too low and correct it in the computer - which then corrects it in the automatic pilot. And once there is the hand-off to the pilot then there can be an error notification if they are below the correct altitude. The reality is that we have a continual set of anomalies regarding altitude that do not make sense. One day doing okay - another day totally out of the ball park. That is telling anyone looking at it that the programming needs to be corrected. Human error is a story for another day. But do not pretend that every pilot flying around at 3 AM is at the top of his game or is experienced. "amendments that decree new noise measuring protocols, metrics, or thresholds; dictate flight paths; and/or adopt airport-specific flight procedures or aircraft operating restrictions would be highly concerning." Basically, they aim to ensure this low-altitude 24/7 barrage by anything that flies continues unchecked and keeps increases. More money more money more MONEY! It's never enough. And these private-interest lobbying groups set against the common good of human health and the environment have no problem using the spurious noise modeling (as Congress and FAA do with FONSI) to further the outrageous claim that noise and air pollution has decreased while capacity is increasing and altitudes are constant reminders of 9/11. This isn't democracy. This is plutocracy. I think elected officials should have to where outfits like NASCAR racers so we know who they're sold out to. Like the aviation associations signed on to this letter to our Senators. All so lucky could to have Oak, SFO, SJC could shoulder the increased traffic instead of unlucky few getting all the traffic. Lucky people don't need cities to join together, boy these threads seem to attract the lucky ones. Lucky are also all the people who can pay and sit back as their lobbysts send letters like the one HTM just posted about the "tremendous" noise reduction from these caring folks. I've mentioned before that plane crashes have unsurprisingly been on the rise, shockingly so. With GA taking the gold on percentage increase. Two callouts though, within days of each other, are the airport worker who quite easily got hold of a turboprop at SeaTac and the barrel rolls was the heads up that something might be amiss, like someone who wasn't a pilot on a suicide mission? Next, the professional pilot in Idaho, Duane Youd, with a domestic violence record, who at 2:30am flew out of the airport and crashed his Cessna into his home after stewing over his relationship problems with his spouse. Fortunately the spouse and son were unharmed. The #1 issue we're dealing with is the insanely low altitudes that the NextGen program has unleashed, by every type of aircraft. You seriously cannot keep up with the number of crashes going on and people interviewed, wherever they are say, Yeah we're heard it flying low but we hear that a lot and it wasn't until we heard a boom... etc. TOO LOW, TOO LOUD, TOO MANY. And pilot's licenses are as loose on regulation as guns. Lovely, pilots using planes like kamikazes or for murder-suicide missions. Thanks NextGen masterminds, we won't even know something's amiss until it's too late, we'll just figure its more of the Congress mandated hell over our heads. You really have to wonder what's the agenda considering flying low with planes in war, without dropping bombs, is purely to strike fear and to demoralize a people. Professional pilot who crashed his plane into his house was in Utah not Idaho. Important to keep in mind when the aviation stakeholders and their government administrators of the NextGen program give you their spiels. There can be no society for the common good when abstract principles triumph over human realities. When they are used to permit the infliction of harm and death to humans and destruction of the environment. Social mobility in this ECONOMY our elected officials sacrifice our sleep, enjoyment of our homes, at pleasure in the outdoors to is on a steep decline. People are working more and more for less and less, and NextGen low altitude flight paths across our nation ensures they are doing this on less sleep than needed to avoid illness and premature death, and this less sleep is fractured. A colleague who isn't bothered by noise of any kind, nor the aircraft low over his rooftop, was still feeling "tired" as he put it and decided to put on a sleep monitoring device. Turns out most nights he wasn't even managing 5 hrs unbroken. So don't accept abstract principles over human realties - don't accept your quality of life on the rubbish heap in the name of the economy, efficiency and safety. This is the economy for the few, these NextGen flight paths (runways in the skies) are not efficient, and they are not safe. Enough talking we need action. And we need elected officials with a moral compass to do the right thing. In the meantime, please hit the money all you can - Don't fly or ship by air unless you ABSOLUTELY have to, i.e. cut all inessential air-travel for yourself and goods. If every American affected by NextGen did this we would see things turn around. You don't have to take to the streets to do something that causes a revolution. Be the revolution. My hope is with citizens. It's because of citizens, not our elected officials, that there's been any resistance to NextGen. "Never heard of an airplane landing at high altitude." Since when do planes have to "land" 20 miles away from the airport? The altitudes are ridiculously LOW over communities as far as 60 miles away from the airport. It is because the Nextgen color by number instructions for pilots - to "fly" is actually to adapt to pilots' or flying equipment errors or inefficiencies, and lack of capacity to land a plane without needing training wheels to practically walk to SFO from the Sta Cruz mountains. Nextgen is "safer" only because the airlines ecosystem that FAA has to deal with deals a scary scenario without training wheels and taking over our skies to use more and more space to land almost the same amount of planes as the highs of the 90's. The same genius who are trotting the "tremendous" noise reduction who apparently cannot even do math. Not anymore at least. How are Class B changes working out for you all? A far easier solution would be to soundproof one's entire house. We had that done to alleviate neighbor complaints about one son's drumming & his sibling who plays metal/guitar. Surprisingly enough, the house is quieter on the inside as well. Just tear out your drywall & insulate + baffle the area beneath the roof. Works wonders. Now we can't even hear cars going by or late night tomcat fights. You mean a solution for *some* of the noise. The particulates from partially burnt jet fuel from low flying airplanes would not be solved by insulation. *some* of the noise could be helped by insulation but the Lower frequency noise is not resolved by insulation. That noise goes through walls and your skin. Insulation is expensive, should that cost also be borne by the people on the ground? The your solution is not quite as simple as you make it sound. In addition to insulating, you also have to become a shut-in. Many people may find it hard to live sealed up in their home 24/7. Such a wide variety of comments regarding noise. I suspect that that the people who live close to the coast range area - Barron Park are in part sheltered by the proximity to the upgrade to Foothill Expressway up to 280. People who live closer to the flatlands of 101 which the planes use as a guidepost get more of the brunt of the noise. People tucked in near Foothill Expressway and Alameda De Pulgas are in more protected area. Planes at night use major roadways which are lit up to indicate that they are lined up to the airport. So please understand where your house is, the amount of territorial protection afforded by your location, vs the open areas that other people are residing in. My house where I live is under the cross-over point at which the planes make their rotation north to SFO. If my thoughts are incorrect on that point then please report on the noise level where you live and the amount of protection afforded by your location. That is extensive tree coverage and hilly terrain. So who do you blame for other vulnerable populations such as autism, or other conditions like childhood where the population is more sensitive and least able to complain. The problems brought about from Nextgen are new, nobody expected them. Except maybe these folks who knew, and just expected the blame would be directed elsewhere. Is the Palo Alto Airport feeling left out of this discussion? A small white plane has been circling overhead for about an hour. It does not appear to be a police or TV plane and is high enough to not see the markings. So the question on the table is what are the rules for small/private planes flying out of PA Airport? Is there not a threshold for irritation for the rules of what goes on here? If it is a flying school then is it going to spend hours circling the city making the most irritating sound on a continual basis? There are lots of police sirens so is it some dire emergency? It is one thing to complain about SFO SJC and OAK which has arms length management however this is a local airport which we pay the manager. So who is the manager these days? We are not a target for flying schools. @resident, that was San Mateo County Sheriff's Cessna 206, out of San Carlos airport. Usually on display at their annual Airport Day. Nice equipment. Don't know what they were doing this afternoon. Spent a couple hours orbiting various highway interchanges from 101-University down to around 85 at 237. I haven't seen any news stories. They stayed at 2900 feet altitude the whole time. Yesterday SFO airspace began at 2500 feet above University Avenue, but today it was changed to 3000 feet. Gives Palo Alto departures a bit more breathing room up there. Thank you for the info. Relative to altitude a large commercial jet (white with turquoise tail) was actually lower than the small plane as it was crossing over. And at 2900 feet the San Carlos plane was loud and irritating. This is not the first time the white plane has performed the same time in Santa Clara County. So question is where is the Santa Clara County sheriff's plane located? We should all note that the San Jose Airport has extensive private jet installations on the west side of the runways in what used to be a parking lot. That was built up in support of events at the stadiums. Helicopter lessons - that is where all of that activity should be located - not in a residential located small airport. What ever goals small airports like Palo Alto and San Carlos have to develop more revenue business needs to checked. Both are located on marsh land that if believe the papers is going to be under water soon. "Is the Palo Alto Airport feeling left out of this discussion?" Judging from the 20 likes of the J. Hillman post - a pilot resident of Portola Valley, you can bet that airport groupies are in this discussion. Non-Palo Alto residents who fly in and out of Palo Alto Airport are part of the peanut gallery on these threads. These folks are organized and need to silence any noise discussions, ridicule people who are affected, and obfuscate and lie about the pollution that is caused by aviation. The letter from the organized groups who are influencing FAA, and airports (including Palo Alto) is here. A pilot of a commercial airplane flying out of an airport on a scheduled flight is responsible for getting the plane off the ground, square away the wheels and flaps, and then the automatic pilot takes over and controls the plane to the destination at which point the pilot needs to get the wheels down and get the plane on the ground. Then get the plane to the right gate so the passengers can unload. Maybe our resident commercial pilot can explain how the altitude is controlled at each of these points. I think there is no mistake that the Orange County Airport - John Wayne - has a tightly controlled take off since it is in the vicinity of the regional FAA for the northwest region and is next to a government military location. The pilot is not controlling the altitude - the ATC is through programming for the altitude. So no one is protecting anything here - out of their control. Exception appears to take place with some flights which are for freight vs passengers. Not sure how or why the Korean flight which is a freight flight manages to screw up their incoming flight. Oakland - ATC for this area needs to step up to the plate here and get this show under control. News helicopters should banned from flying overhead as well. It's very unnerving to be evacuating one's dwelling and salvaging whatever you can while these knuckleheads are flying directly above you and sensationalizing your misfortunes. It would be helpful if our resident pilot - Mr. Hillman - Explain how altitude is authorized and by who. Yes - every type plane has a different noise level. But noise can be mitigated by altitude. I am taking the position that altitude is part of the problem. That is not a mechanical problem - it is a problem related to the decision making of the ATC, pilot, and company that owns the plane. Can he please share the decision points related to altitude. the goal is in part to raise the altitude over populated areas. Thank you. >> Explain how altitude is authorized and by who. I have a very stressful job as an ATC. In controlled air spaces, each plane is assigned a lane based on altitude/direction (take-offs/landings/cruising). Planes depart one air space & enter another during the course of travel. Perhaps you have seen on TV or in movies those little blips that appear on a radar screen. Our job is to ensure that each plane has been assigned a safe operating zone in which to fly. This avoids collisions. In congested air traffic areas...SFO, LAX, Logan, O'Hare, Dulles, La Guardia etc. this can get very tricky due to the number of planes on approach & take-offs. The lanes are designated by FAA protocols. The only way to alleviate this residential noise issue would be to relocate the airports...say somewhere like San Benito County & then provide passengers with a shuttle service to their various final destinations (i.e. San Francisco, Silicon Valley, East bay et al.). There are only X numbers of points on a compass so someone is going to get the residual noise depending on where they reside. The SF Bay is only feasible for a limited number of approaches & landings. As a result, other areas will be impacted. BTW, take-offs are louder due to the thrust required to get those behemoths airborne. Once they are at 30K feet no one can hear them. "I have a very stressful job as an ATC. In controlled air spaces, each plane is assigned a lane based on altitude/direction (take-offs/landings/cruising)." Can you share how your job as an Air Traffic Controller has changed since Nextgen started? How would you explain the change in noise from Nextgen? SFO had declining operations when Nextgen began and it hasn't grown materially, but the noise is an exponential change. If fewer people vacationed in Hawaii & there was less air traffic coming from & headed towards Asia/Pacific, Santa Cruz County wouldn't have this issue. East-West US continental air travel is the primary source of these SF Bay Area noise concerns. The only alternative is steamship travel across the Pacific & the use of trains & busses for cross-country purposes. And let's not overlook the plane-related noise generated by the air transport of cargo. It's all a by-product of convenience & expedited service. The cargo flights used to cross over Woodside and were moved to cross over Palo Alto so in your case you escaped. >> Can you share how your job as an Air Traffic Controller has changed since Nextgen started? Faster, more accurate details. Higher expectations of air-related safety. >>How would you explain the change in noise from Nextgen? Though modern planes are being designed to produce less residual noise, the added recognition of any noise is primarily due to higher population densities in certain areas. "Faster, more accurate details. Higher expectations of air-related safety." You mentioned earlier that you have a very stressful job in ATC, "stress", "faster", "more details" doesn't actually sound safer or a gain for the purported modernization effort from Nextgen. "Though modern planes are being designed to produce less residual noise, the added recognition of any noise is primarily due to higher population densities in certain areas." Nextgen claims to reduce noise exposure to the amount of people affected, did someone forget to actually count population? This however is not an explanation for actual noise increases. I am reading this and there is still no definitive answer as to who authorizes the altitude at specific change spots and how that is conveyed to the airplane - at what point does automatic pilot release to the pilot for landing? I am assuming that the "lanes" already have designated levels of altitude. Some decision is made by someone to approve an altitude level at less than 4,000. If all are at 4,000 or above in the same ratio then the safety level would be the same - just raised at a higher level of altitude. Talk of lanes - raise the altitude of the lane. What level of politics is pushing the plane closer to the ground? How does pushing the plane closer to the ground increase safety? It doesn't - it increases the ratio for error. Is "Blame" at Oakland ATC - ZOA? Where are you specifically located? It's obvious that very few here could handle serving on USN aircraft carrier or land-based USAF air strip. ....How does pushing the plane closer to the ground increase safety? The question more specifically is about pushing planes closer to the ground 20 - 60 miles away from landing. Yes the planes are flying lower, hence the increased noise in large part. One suggesion: Look up "Wake Recat"
It is not directly Next Gen that dictates lower altitudes. I am no expert but here is a general explanation as I understand it. To enable more traffic the FAA/Airport want planes to fly closer to each other, so that there is less time between landings. However, an airplane's wake disturbance can be dangerous for the plane(s) behind it. For some reason, flying planes lower makes it less dangerous. So, flying planes lower allows for them to be lined up more closely to each other and thus to have a higher number of landings in any given period of time. Of course, this may also add to the stress of our above ATC friend. At any rate, this is why FAA/Airport officials tell you it's all about safety. Except that it is not, really. It is about having planes as closely spaced to each other as possible to increase traffic flow... and airport and airline incomes. Is it possible to design an electric airplane? Kind of like a Tesla/Prius inspired airliner? Maybe something with solar-cells on the wings for energy and a jet booster-power pack + catapult for take-offs. Vertical electric motors might offer another possibility or perhaps even balloons. Cruising speed would probably be lower than that of a 737 but the noise factor would be greatly reduced upon descent and eventual landing. Our teacher was discussing this noise topic in class and most of my friends like the sound that comes from jet planes. It's cool. Maybe it's just the old people who don't like it. "Our teacher was discussing this noise topic in class and most of my friends like the sound that comes from jet planes. It's cool." Some teenagers like loud music, concerts, and loud planes. Older people may be hearing impaired but you cannot assume that only less sensitive age groups matter. Younger children, autistic kids and vulnerable people can be particularly sensitive. Loud planes at night are a problem for *all* ages. There's a time and a place and loud planes while people are sleeping is not good. You have control over how loud and how often you expose yourself to something that gives you a thrill and it's different with planes. Planes are more suitable flying high, not in training wheels bothering people 20-60 miles far from the airport. Trying to zero in here on where the public needs to focus resolution. The altitude level in the lane is one part of it - raise the altitude defined for the lane. Accelerating the number of planes in the vicinity of the airport is not helping because there is not enough space on the ground for the planes to get to their gates. SFO has already run into planes on the ground tagging each other. So someone made a mathematical calculation that does not match actual experience on the ground. And if there are too many planes at specific high traffic times then they have to circle and wait for a authorization to get into the queue for landing. At some point they need to concede that the mathematical calculation does not work in real life with real people trying to navigate the overall picture. Time to dial back the assumptions which were wrong and smooth out the achievable goals for everyone - higher altitude with less compresssed traffic. And we have no reason for flights very low over residential areas at hours of the early morning. It is called common sense and doing the right thing. The other calculation that enters into this is the grading system that is set up to compete who arrives at their scheduled time. Yes - they get graded on that. I have seen those calculations in the papers. So is everyone trying to beat some score as to arriving on schedule when the schedule puts everyone at risk? All planes have to arrive at scheduled times so they get to the gates and unload, load then get back out of the gate for the next plane. The compression of the schedule is the other wild card here. Side note - it was stated in the papers today that American was going to scale back the number of flights due to increased cost in fuel. So if overall schedules are being re-calculated based on reduced flights then timing is good for other changes in flight schedules which drive the immediacy of lower altitudes and more planes in the queue. Fun fact. Palo Alto and other communities under the concentrated "nextgen" flight paths are actually exposed to a greater number of aircraft arrivals than a typical aircraft carrier that is not involved in combat operations. HAL 12 was loud and low as it flew over Palo Alto at 8:55 this evening August 22, 2018. Flew to Paris one year and it was in a farm field. It was a hub and was dislocated from the city. So they have figured out the number of choices to protect the city and move people from point a to point b quickly. I think most of the flyers were making connection to other locations as it was the close of the school year. SFO is a hub which creates the problem of all of the planes coming in from the Pacific area - all of those people are making connections to other cities - or leaving to go to Pacific loctions. That drives the immediacy of the schedule as they all are making connections to other flights. SJC is a final destination airport. It has been suggested that a good location for a major hub be moved out to a central valley location with connectors to SF via BART, ACE, etc. Think Livermore where- there is a large amount of land owned by the state, fed government which would work well. It is also protected from ocean surge and flooding issues. That would move major air traffic over the central valley which is farm land. Cheaper housing for airport personnel which would create a good labor base for that area. Also new hotels to support airport travelers. Lots of good choices out there. SFO would of course remain but reduce the amount of "hub" traffic. People have to be where their connecting flights are. > higher altitude with less compressed traffic. But what comes up must come down. Especially airplanes. Trust me. Kind of like adequate spacing on the freeway but traffic congestion once in town & looking for a parking space. "Kind of like adequate spacing on the freeway but traffic congestion once in town & looking for a parking space." Airplanes going to SFO generate ca$$$h for the City of San Francisco. Roughly the same amount of traffic going into SFO has caused the noise that didn't exist before the new system. Planes that went up also came down before the noise. The new system appears to be neither safer, more modern, or better for anyone from Air Traffic Controller's comments. It's high stress, "more details," and obviously short on explanation of why the old system which was safe, had the same amount of operations (or more) changed to cause so much noise. Other problem is airport size. LAX has more ground space available so can handle more flights. SFO is now limited in space for any additional growth. Possibly too many flights are being focused on SFO - over selling the capability. Someone at the airport needs to evaluate what the maximum load is available at rush hour times. That load has to be evaluated against SJC which is trying to increase the number of airlines that it services. The area can only support so much traffic at rush hours and feel like they are pushing for too many flights which are then circling to get in to the queue. The FAA should have some models as to airport size and number of flights per day. So the argument grows to move to a more central Hub that has a lot of land for growth and increased air traffic. CONGRESS, CONGRESS, CONGRESS. Our members of Congress, Democans and Republicrats, legislated this. Legal and illegal does not equal right and wrong. This legal hell over our heads is wrong. It is deadly. Take a cue from the aviation stakeholders. Who do they lobby? They know who created the hell for their profit and who can undo it - our Congress members - and so they don't stop telling them they better not undo it. Everything else is a game of attrition. You know you're deep down the rabbit hole they made for you when you're the average citizen trying to live your daily life and the members of Congress have YOU coming up with "solutions" to the hell they legislated, and you're talking waypoints and track acronyms and such. Every meeting they're getting paid at the public's expense and you're not and you're further down the rabbit hole. A guy in SoCal made an app that simplifies airport noise complaints. These complaints systems are BS, further abuse, attrition of energy. How about an app that hits the Inbox of every member of Congress, their interns up to their eyeballs with that rather than scurrying around bringing coffee to the private interest lobbyists waiting their turn. California lawmakers got all brave about coffee, now the ENEMY of the people is plastic straws. What a circus! When will people wake up! All quiet on NextGen though... need more studies. Complaining about airplane is kind like complaining about smog. It comes with the territory...the modern world. The air you are breathing is a lot better than it was in the 1960s... because people did something. >> One suggesion: Look up "Wake Recat"
>> To enable more traffic the FAA/Airport want planes to fly closer to each other, so that there is less time between landings. However, an airplane's wake disturbance can be dangerous for the plane(s) behind it. For some reason, flying planes lower makes it less dangerous. Do the separation criteria actually depend on altitude? I don't see documentation for that online, but, perhaps I'm missing it. Wake Recat is planes flying level and slow with less turbulence in order to fly them closer together; these low altitude flight paths are runways that don't have to be built at the expense of human health and the environment bearing the burden of noise and air pollution right over our heads - SAFELY and EFFICIENTLY making aviation stakeholders more profits. GPS instead of radar is not the cause of this. Increased accuracy is great. Pre-NextGen altitudes and angles of ascent/descent could still be used with the bonus of greater navigational accuracy. Instead it's used to harm human health and the environment by flying planes low and closer together to increase capacity for stakeholders' profit. And with pilotless flights being another of the stakeholders' objectives to increase profits, the less angle of ascent/descent the better; it's easier, takes less skill. Drones. It's never enough. Humans on the ground are for the rubbish heap to these stakeholders. And commercial/cargo pilots are seen as a profit drain and slated for the heap as soon as possible. Humans are being eliminated from the control towers as much as possible. I assume the goal will be robots as flight attendants doing the safety spiels, serving drinks and meals on a pilotless flight. And people will pay more and more for less and less. "Humans are being eliminated from the control towers as much as possible." Machines or "auto" pilots aren't working out so well from what the air traffic controller posted above, it still takes imperfect human pilots to make noise. there's also imperfect people like the FAA consultants The MITRE Corporation (consultants in Chief to FAA) which is a .org (?) Web Link and likely push rote consultant type advice to FAA. You're right, the only thing holding back pilotless flights is where they're at with technology, but it's being actively pursued. For e.g., it's in the works with Boeing and its major competitor Airbus. Talk is about saving billions. Keep increasing capacity, make takeoffs and landings as easy as possible (come in slow, low, minimum angles of ascent and descent), and get rid of as many human as possible equals more and more money for the aviation industry stakeholders. Technology can be used well or ill. It's being used ill for greed. Hence, the objective to automate everything possible and get rid of humans. Automation can have its place but it shouldn't have THE place. The majority of humans are not valued by industry captains and their investors. If they can make more money than ever before, which is currently the case, while simultaneously eliminating jobs they will do it without a care at the society that creates. It's not can something be done, but should it be? Do we want a human-based society or a human-devoid society for the profit of a few? This 24/7 low altitude barrage with NextGen is what you get when humans and the environment are devalued for the few. I haven't heard of any elimination of air traffic controller jobs, but it does seem that Nextgen has added some automation type features that take away control away from both air traffic controllers and from pilots. The reduced safety is what they make up by taking up more miles to land planes and thus add noise to people 20-60 miles away. Humans are still involved though, if nothing else to make excuses for the reduced safety by selling it as increased safety. There was a large article in the paper about the residents of Sunnyvale, MV, and Cupertino regarding airport noise - we had an also mention in that article. So the politicians on CA are telling us we are the 6th biggest economy in the world. And that is focused on technology. So here we are in the middle of FB, Google, Apple, and other tech firms creating the 6th biggest economy and yet we appear to be powerless concerning the FAA abuse reigning down on our heads. And don't tie that to the current administration - this was all going on for quite a while pre-2016. The worst offenders are the foreign airlines which have the biggest planes, and in the case of the Korean freight plane in the middle of the night - we are being punished by a US government organization which is catering to this abysmal situation. Everyone across the US is complaining yet the FFA is glued to some computer generated program in which the assumptions are only half correct. Can we just say that the great experiment has failed and needs to be reworked? Comon congress - get your act together and quit working like an expose tabloid. Do some real work. Reduced safety? Air travel has been extraordinarily safe the last 10 years. What are you basing your statement on? >> is what they make up by taking up more miles to land planes and thus add noise to people 20-60 miles away. Airport approaches do seem to be lower on average, but, from reading about the flexibility that NextGen is supposed to provide, as well as the slightly modified separation rules, I don't see how the result is lower approaches. What I have observed based on looking up aircraft that fly over Palo Alto is that the biggest factor by far with respect to noise is how old the aircraft are. Specifically, older "Stage 3" aircraft are much noisier, and have more annoying noise, than newer "Stage 4" and "Stage 5" aircraft. Specifically, older B737 and A320 mostly. Not to mention older much smaller jets of various uses. I think the approach altitude issue is interesting and worth pursuing, but, I still haven't seen a clear explanation for what is driving the lower approaches to SFO. I don't see how NextGen or the separation rules are directly responsible. Does anyone have some good online references that explain it? In the meantime, keep lobbying to get the Stage 3/older aircraft retired. They are mostly less fuel efficient, also. You need to understand there are a lot of smart people in the areas effected by "nextgen" and they have been researching and sharing information about "nextgen" for close to four years now. If you want to make a contribution to the discussion you are going to have get to work and do your own research. There is plenty of information on the internet, if you care to be informed. Don't expect people on this forum to spoon feed you information. The video linked below might help you get a start on your journey of understanding. You'll find loads on the goal of automating air traffic control. Humans do an amazing job. How many commercial/cargo accidents? But that's not what its about. Safety and efficiency is the mantra. But the #1 is increasing capacity while reducing human labor costs. Industry captains and investors like labor costs as close to slavery as possible. They love money and control. If you eliminate what you can't 100% control, what might talk back, fight back, as much as possible and automate while making more money than ever that's the objective. The rest can scramble for crumbs. Since the technology isn't where they want it to be yet, humans are still using the current stage of it and helping to get it to where they won't be needed any longer. Pilots and air traffic controllers are staging in their own demise. Congress hasn't done squat because it legislated this. It's the plan. So back to low and slow over our heads miles and miles from any airport, or Wake Recat - increase capacity, with nose to tail planes 20, 60+ miles from an airport. Those flight paths are really taxiing planes that make the takeoff/landing stats look more "efficient" but their just waiting to arrive or depart on the invisible tarmac of our country's low altitudes skies. And as far as what stage of aircraft are being used. No one was talking about this, or waypoints, or acronyms for flights paths pre-NextGen. Another rabbit hole. Yeah, good, get rid of old crappy, loud aircraft. But most people didn't have a clue what was being flown until this program started unless you truly lived right next to an airport. "Can we just say that the great experiment has failed and needs to be reworked?" When something fails the reaction is unfortunately often to hide, fudge, or obfuscate and steer attention *away* from what could need re-working. Notice that the press only repeats what FAA or politicians want people to hear. "Reduced safety? Air travel has been extraordinarily safe the last 10 years. What are you basing your statement on?" Precisely - air travel has been extraordinarily safe for years and the number of operations at SFO (source of most of the noise on the Peninsula) was *declining* when SFO noise problems started in Palo ALto. SFO operations may only now be at the highs of the 90's. I also base the safety remark on the claim that Nextgen makes things safer. From what? Unsafe conditions before? They forget to mentione the Nextgen step that made the system less safe. "I don't see how NextGen or the separation rules are directly responsible. Does anyone have some good online references that explain it?" It's pretty obvious that reduced separation between planes causes additional or unique levels of congestion where there was none before things became less safe(and "go arounds" - planes almost landing on top of other planes, asked to "go around" and give people a second dose of noise). Pilots are given a color by number path which makes things safer? If you find any better explanations about why the system that was safe now is not as safe and needs help, then pleas share. - Population growth (per air traffic controller's post), that more people are noticing more lower flying planes. It's not population growth, there are in fact more planes flying lower, FAA concedes that. A big problem for us in this area is that we had a capable SFO manager who retired and now have a manager who is a political appointment with no prior experience running an airport - Mayor Lee appointment. A person does not have to look any further than SF politics which is all about who you know - not what you know. Unfortunately California politics is being driven by all sorts of qualifiers which are exclusive of actual experience and educational background in the subject at hand. Not sure to what extent that extends to the FAA upper echelon - but these people have been there a long time. There cannot be this much discussion on this topic at a national level that lack of competence can go unnoticed. This topic is discussed in the main national newspapers. I think that there should be a law suit that requires reporting of altitude requirements at each phase of the flight and where specifically the pilot is talking to a controller at specific locations. We know that the plane is operating on automatic pilot for the majority of the trip. We also know that local ATC takes over at some point assigned for the transfer for the descent. And we also know that the pilot has to take over to put the plane on the ground and get it to the gate. The gap is in the descent and altitude assigned for that function. That is the problem area that needs definition. "A big problem for us in this area is that we had a capable SFO manager who retired"
If you are referring to retired SFO director John L. Martin, I would strongly disagree that Martin was "capable" about noise issues. John L. Martin should have been the front line of protecting communities when Nextgen was developed. Instead, Martin presided over Nextgen implementation which was with barely any notice to the impacted communities (FAA gave notice but too late). Yet, if you Google long enough you can see Martin's push for Nextgen on behalf of SFO (so it's not like he "didn't know" what the plan was about). Martin also presided over three rejections of Palo Alto when PA applied to the SFO Roundtable and reneged on a 2000 agreement to put noise monitors at Menlo waypoint. Martin was perhaps a capable servant for San Francisco, the airlines, the airport, and the pot of politicians that run everything but it was under Martin's nose that the noise mess was created. Can't get worse than this. One possible solution would be for a total redesign of commercial passenger planes. Eliminate the existing planes over time & switch to VTOL (Vertical-Take-Off-Landing). That way the landings & take-offs would require less airspace and ground. And it would enable even more planes to operate in a given area. I am directly under the flight path of planes coming from three directions. These planes are flying lower than they did a decade ago. I have fruit trees in my backyard. These planes spew jet fuel and I know that even in small amounts certain jet fuel components cause cancer. Cause, not simply correlated with. Is there a way, preferably local, to test my fruit for presence of these harmful chemicals at the low quantities necessary to eliminate statistically significant risk of eating the fruit because of those chemicals? QUOTE: I have fruit trees in my backyard. These planes spew jet fuel and I know that even in small amounts certain jet fuel components cause cancer. Cause, not simply correlated with. It is my understanding that most of the dumped jet fuel evaporates before reaching the ground & the amount that actually comes in contact with the earth is supposedly minimal. On the other hand, jet fuel is considered carcinogenic for those who are in direct contact with it on a regular basis (e.g. airplane mechanics, lab mice etc.). This URL/link explores the health ramifications in detail. Curious. What kind of fruit trees are you talking about? Could the skin simply be washed or is there a concern about the residual jet fuel actually being inside the fruit? Jet fuel, diesel fuel, and kerosene are all basically the same oily product with slightly different levels of refinement and additives. Only a small amount of volatile and aromatic components evaporate from these fuels. That is why it is so hard to achieve complete combustion with these fuels. Jet fuel will support the growth of fungus so manufacturers spike it with fungicides to prevent fungus from fouling their systems. Has the FAA studied the health risks associated with burned fungicides? "One possible solution would be for a total redesign of commercial passenger planes." Hmm, how long would you estimate for a "total redesign" of airplanes, and then how long it takes to change fleets. That's after anyone would invest in it, which means asking taxpayers to pay for it, the aviation industry business model. Your "solution" sounds like the stale story about quieter planes. Planes are not quiet when they are too close or if there are too many of them flying close. It's like quiet 3rd graders. Put 300 in a room and how quiet can they be. Time for a law suit citing gross incompetence in creating a system which is acceptable to the "sky community" and also acceptable to the ground people. It is gross incompetence to have planes flying low over residential areas that have been long established and then claim that some computer system did it. We know that the plane is flying automatic for the majority of the trip - no problem there - usually about 30,000 feet. If you are flying in from Hawaii there is always an announcement that the plane is preparing for descent - turn off your personal computers. That usually occurs as the plane is approaching land and crossing the coast range. Is that where the ACT takes over - or does the pilot take over? That is where our problem is. Lack of definition to the public as to allowable altitude levels is incompetence. Allowing a plane to call the shots on altitude with no regard for altitude requirements is incompetence. I think the break point is the HWY 92 bridge at which point the plane is over the water. So I think we are concerned with the space between the coast range and the bridge. We need that defined with an altitude level that is acceptable to all - 5,000 feet and then let the plane organize itself for landing when over the water. Given the valuable resources under the plane - both commercial and residential then that is a reasonable requirement. Time to talk turkey with the FAA - and as I sit here typing the morning rush is on. Sounds like desperate people out there maxing out to meet a schedule imposed on them by the company they work for and the available gates at any one time. SFO does not have unlimited space - it is land locked by the bay and surrounding communities. So lots of "groups" have overloaded and over sold the system availability at any one time at such hour peak periods. Another level of incompetence in airport management. Not interested in all of the players pointing their fingers at some one else as to who is incompetent party here. >> Anon, "Reduced safety? Air travel has been extraordinarily safe the last 10 years. What are you basing your statement on?" Statistically, aircraft safety has been highly correlated with the design-age of the aircraft. I've posted the link for that before. ~B767 and later design aircraft have been highly safe, statistically. Recent designs are also a lot quieter. IOW, I don't understand your point regarding safety. Sorry. >> > "I don't see how NextGen or the separation rules are directly responsible. Does anyone have some good online references that explain it?" Nothing is that obvious to me. I need to read statistically strong studies that can show correlations. Then, I'm engaged. Hopefully what follows are studies that mechanisms that are likely to be causal. For example, it may be the case that updated separation rules have resulted in lower average altitude approaches to airports. It may be the case, or, it may not. Maybe average approach altitude hasn't gone down. Or maybe it has gone down for a different reason-- climate, and, weather. Or because some airlines (e.g. Southwest, United, ...?) have made certain choices regarding routes, frequency of flights, aircraft capacity, aircraft models, etc, that taken together have resulted in lower approaches. I don't know. "Show me." "Is that where the ACT takes over - or does the pilot take over?" I believe there are two parts, one part are the "procedures" which are designed by FAA experts (I presume) which have the color by number instructions for pilots, waypoints and altitudes to hit when. The procedure "design" is a big deal. The first SERFR 2 procedure was designed to end at Menlo and hit Menlo at 4000 feet, where the previous average altitudes of SFO arrivals crossing Menlo was 5000-6000 feet. The study FAA did about the impact of reducing altitudes resulted in a Finding of No Signifcant Impact. It should be noted that the most significant part of the study was that it never projected the number of airplanes or even where they would fly, if you want to zero in on "gross incompetence"that's the place. Don't count on the courts to fix that, the 9th circuit court rejected the appeal in deference to the agency as the experts. The other part is what happens when the planes are sequenced into SFO and I believe that while Air Traffic Control has some control, I have also heard that they cannot help what happens when the airspace is congested, there are weather issues, wind, and depending on the airplane the pilots may have control of what all they can do. In other words, many variables, no control. Therefore, everyone can point to somebody or something else for the reasons they have "no control" but somehow the new system is safer. If this does not speak for a need for cities joining together I don't know what does but in this next round (round 2-3?) instead of believing all the sound bytes from the industry, it's time for real questions and real answers. IRONY: Nextgen claims to help address congestion (not increase it) and waypoints were supposed to disappear but you still have color by number. I’m more concerned about roots absorption of jet fuel components that make it to the ground and below. I just developed a method to square the circle using a straightedge and compass. Proof? This is a Town Square it's not for me to show anything! Surely someone out there has a factually-based website that brings together the issues with NextGen and the modified separation rules and other safety and environmental concerns. Because otherwise, all we have to go on is -anecdotes-. Sorry my sense of humor didn't come across but I was serious about the potential non-serious nature of being asked to "show" why it seems obvious (to me) that there was a previously safe system (which you seem to agree with); then I suggest it became not so safe due to newly created congestion, and then supposedly is now safe. This may help "show" my conclusions but in all seriousness it should be the cities or experts showing you details and data and statistics behind this. Headline: "New FAA Procedures Reduce Separations at Major Airports"
"Frequent SFO Go-Arounds Point to Safety Concerns"
A system that was safe has changed. The need to fly lower and the new congestion created by the new patterns is not exactly "safer" than before. My point though I guess is that flying higher and with less congestion was not unsafe before. The claim that Nextgen reduces congestion doesn't add up. So far we have to people who have claimed some responsibility for the activities of the plane once it starts it's descent. One who claims to be an ATC and one who claims to be a commercial pilot. So what are the numbers - altitude required at each point - and who is controlling the plane at each point. Where does Oakland ZOA come into play? The FAA cite says that ZOA is the ATC for this area. Side Note: If you read any Stuart Woods books he is a pilot and he walks you through the numbers and conversation with the ATC. He has graduated to a very large plane owned by a major security company and describes the steps to coordinate getting that into the air. It is numbers. Wake Recat - biggest problem with accelerating the number of landings in a given period is that there has to be enough gates available and enough ground crew to unload baggage, refuel plane, clean the cabin, get new food and drinks on board, and then load on passengers for the next flight. The size of the plane and number of passengers will help in defining the amount of time this all takes to successfully maneuver this whole operation. Planes landing faster than are taking off results in congestion on the tarmac. Had this happen a number of times when flights from Hawaii were landed at the international terminal then everyone had to walk over to Terminal 3 - United to get baggage. Alaska Airlines - we all sat out on the tarmac in heavy rain while a plane at the gate was still loading people, cleaning up and refueling. The system is creating a computer model that does not seem to identify the available characteristics of any one airport that qualifies as a hub. Had this problem at Denver Airport - not enough planes so an available plane went to SFO since it was a Hub but the San Jose flight did not go since it was an end destination vs a hub. They had to wait for an available plane for that flight. That is a complaint on the total system which has all type assumptions that don't play out in real life. We are assuming that the descent pattern is under control but reality says that is not so. Managing the whole system is more than low altitude which may be random. This may have changed with Nextgen but used to be that holding patterns were in place for Air Traffic Controllers to use. "Waiting rooms" so to speak. Is there a pilot here who has flown at Heathrow? I've heard they have fines there when pilots make moves that cause noise. Personally fined. A picture of our skies would probably show the Peninsula as the waiting room, and this because maybe it's quicker, more "efficient"?